I was invited to tour the Minnesota YMCA’s “Youth in Government” Model Assembly program this past weekend. 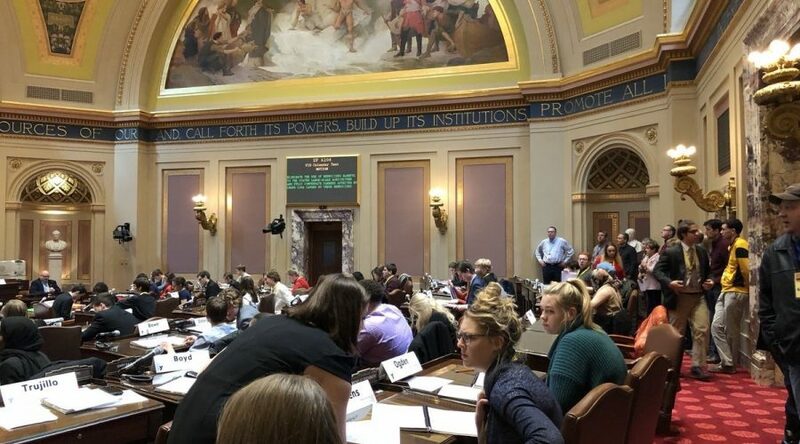 The Model Assembly welcomed approximately 1,500 students from across Minnesota to engage in a real-world simulation of governing based our democratic principles. Thanks to the Northfield YMCA, 32 Northfield School District students participated this year. This is a fantastic example of the kinds of authentic learning that is so meaningful to our students. I was impressed with the level of organization, the passion, and the expertise that students used while engaging in the types of activities government is responsible for completing. I observed students drafting and debating legislation, responding to a hypothetical state-wide crisis, discussing issues of national importance, and ruling on legal matters. Foundational academic skills and background knowledge are essential components of becoming an educated person. Getting to apply those skills and knowledge in an authentic environment makes that classroom learning come to life. The Model Assembly allows students to use what they have learned and to experience that life does not always precisely unfold as it does within the classroom. Northfield School District staff understand it is essential for student success that we offer opportunities to engage in meaningful, hands-on opportunities like Model Assembly. At the elementary level, “maker spaces” at Bridgewater and Greenvale Park are providing that opportunity. In our Middle School, 7th Grade Social Studies teacher Earl Weinmann has students simulate a court case and role-play each responsibility. Northfield High School’s robotics team, mock trial team, and our partnership with Bio-Rad are just a few examples of in-school efforts to give students these kinds of experiences. Our collaborations with Three Links and Laura Baker Services provide students with internship-like opportunities to apply their skills in the world of work for credit. Our local police department hosts a public safety Explore post. These are just a few examples of ways we make learning more than just academic content. There are many more examples I could share but not as many as I would like to see…yet. Our strategic plan indicates we support students on their career journey…wherever it may lead. We will continue to seek ways that we provide these kinds of authentic, hands-on learning experiences that cement the skills initially developed within our classrooms.